I observed the graphics, but I'd like the precise values ​​of the limits for the circuit supply. I haven't seen one for the DNA75, but it is really easy to create one. Ohm's Law is all it is. Take the max current for whatever wattage and then do another for max voltage. That will give you your answers. Here is one for the DNA200, but the right side one is the two cell configuration. 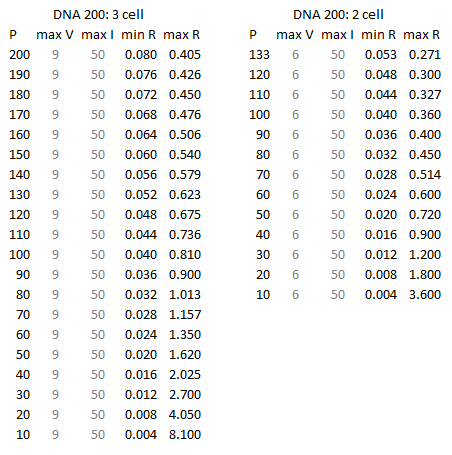 So the max voltage column should be the same (max R), but the DNA75 only puts out 30A max right? So the min R column is the only one that has to be adjusted. Did you also consider that Ni200 from room temperature doubles its resistance when heated to about 400°F? Here is the Ni200 resistance vs. temperature graph. The resistance nearly triples at 600°F. now it is clear we must consider the resistivity increases from early activation. I saw that you are proficient with Excel, are you able to develop a similar table to the above with Ni200? now it is clear we must consider the resistivity increases from early activation. I saw that you are proficient with Excel, are you able to develop a similar table to the above with Ni200? I did the one above to help a user understand an issue with a quite hight res ceramic coil on a VT133, you could but as it depends on your preferred temp I decided not to, but doubling the res would be in the ballpark. My little table has not been confirmed by Evolv so it's nothing official. Oh, I see now. The resistances specified for Ni are for Base value and not the high value it will hit during usage. Brilliant!